The King Is Gone. 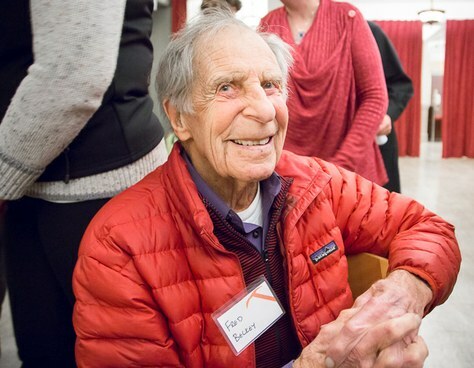 But Fred Beckey Will Never Be Forgotten. The foremost pioneering climber in American history passed away October 30, 2017 in Seattle at the home of his best friend, biographer Megan Bond. Beckey had suffered from congrestive heart failure for many years and, according to Bond, even small amounts of exertion were too much for his weakened system. Beckey’s demise had been creeping up on the climbing world and, year after year, as Beckey pursued goals that only a handful of people knew, we watched as his body struggled to keep up with his mind—a mind yearning to continue to explore new regions, new mountains, new stretches of the vertical world. Beckey’s rise as the foremost practitioner of sport that was virtually unknown when he started doing it is a classic American tale of achievement—or at least the kind of story that’s supposed to be the all-American tale. He was a young immigrant, who, at the age of two, came to the United States from Germany with his family—father Klaus, a surgeon, and mother Marta, an opera singer, and younger brother Helmy—and settled in Seattle. At an early age, Beckey was exposed to the mountains during the family’s regular car-camping in the nearby Cascades. On one trip, he wandered off and climbed Boulder Peak alone. A simple hike by most standards, but his parents, worried he might hurt himself, and enrolled him in the local chapter of the Boy Scouts, where hiking was encouraged. In 1939, he joined The Mountaineers, Seattle’s premiere climnbing organization, and before even his first summer was over, Beckey and his rag-tag friends had made ascents of 35 summits in a region where 20 successful climbs make a standout summer. Indeed, Beckey, Clint Kelley and Lloyd Anderson (the founder of REI), even made the first ascent of Mt. Despair. In 1940, Beckey and his friends again blitzed the Cascades, climbing 50-odd peaks, half of them first ascents. In many cases the peaks and their commensurate glaciers weren’t even mapped properly. Some of the peaks had been seen by only a few humans. In the summer of 1942, Beckey’s star shone ever brighter when he and brother Helmy picked off the second ascent of Mount Waddington, a rime-encrusted pitchfork jabbing the Coastal Range sky in wildest British Columbia. There had been 16 attempts to achieve the first ascent, so when two mere boys—still in their teeens—made the second ascent, the climbing world was flopped squarely on its ear. Nineteen fifty-four saw him make the first asents of Mount Deborah and Mount Hunter, and climb the third route to date on Denali—an Alaska climbing season that equals or betters any ever seen. Helmy drifted away from climbing in the mid-1940s, but Beckey stayed the course, quickly getting involved with bigger, longer, tougher climbs, many of which were in the icy north. Nineteen fifty-four saw him make the first asents of Mount Deborah and Mount Hunter, and climb the third route to date on Denali—an Alaska climbing season that equals or betters any ever seen. By the late 1950s, his technical rock skills were so good he was drawn to British Columbia’s Bugaboos. Beckey had bagged the first ascent of the North Face of Pigeon Spire in 1948. But in 1959, he and Hank Mather pushed the limit on wall climbing with their ascent of the East Face of Snowpatch Spire, the first Grade VI in Canada. Over the following four years, he climbed the most demanding routes in the Bugaboos, including the Beckey-Greenwood on Snowpatch Spire, the West Face of Bugaboo Spire, the Beckey-Chouinard and the Northeast Face on South Howser Tower, the Northwest Face and the Southeast Buttress of Pigeon Spire and the West Buttress of North Howser Tower. While he had been continually picking up his pace in the late 1950s and early 1960s, in 1963, Beckey went wild. He had not been chosen for an expedition to Everest’s West Ridge, or even invited (a sour experience and bad rumors haunted Beckey for years after an aborted 1955 attempt on Lhotse). Beckey’s response was to put all his energy into climbing on this continent, and to many climbers of the day, what Beckey achieved in the mid-’60s makes Jim Whittaker’s repeat of the South Col route on Everest less significant by comparison. Flip through American guidebooks and “Beckey” routes come up in 1963 more than in any other year. From the Cascades to the Sierra Nevada, from Alaska to the Wind Rivers, Beckey was out there making a tremendous mark in American Mountaineering. Throughout the 1960s, Beckey zoomed up and down North America, climbing everything he could get his hands on and occasionally making forays to other continents, and his pace continued unabated well into the 1980s. Finally, in his sixties, he began to show signs of slowing down—just a bit. While Beckey’s crude sense of humor kept him entertained on climbing trips, his sharp intellect kept him busy at home—mostly with writing projects and organizing more trips. In the late 1940s, he wrote his first book, a climbing guide to the Cascade and Olympic Mountains of Washington. That was follwed up by various guides to climbing in parts of Washington, and then his opus magnus, the three-volume Cascasde Alpine Guide that has remained in print for more than four decades. He authored coffee-table and history books, and even a research juggernaut about the history on the northern Cascasde Mountains, the 568-page Range of Glaciers, published in 2003. To see Beckey work as I have several times, pricking keys on the keyboard as if he were dysfunctional and then finding he’d produced some of the most insightful writing about mountains the climbing world might ever know, is mind bending. 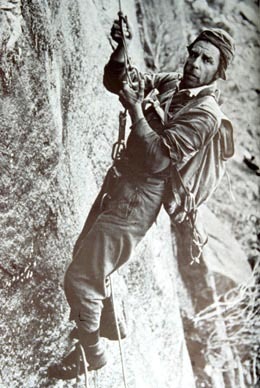 No exact numbers exist, but many American climbers believe that Beckey climbed more new routes than anyone in the world. In fact, in the 1970s, the editor of one mountaineering magazine speculated that Fred had pioneered more than 10,000 new routes—a tally I’ve long searched for in simple stats. But the significance of Beckey routes isn’t the quantity and such numbers should be dispatched to the land of eager sport climbers and their “Bolt-the-Planet” ethos—with Beckey, it’s the quality. All Beckey’s routes are long, impressive, and very natural. 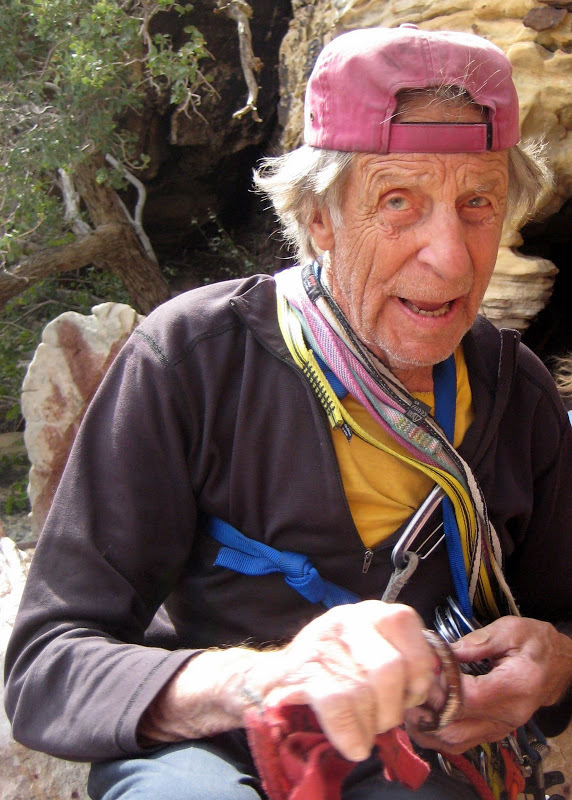 Through the 1990s and until his passing, Beckey continued traveling, writing and, when his old body could hold up, climbing. The awards he received throughout the 2000s are indicative of a public that wasn’t paying attention, but that’s standard practice for humans who are wholly dedicated to their art, and carry on regardles of the day’s headlines. Photo of Beckey in 2008 from audiokarma.org. Paul Petzoldt famously once said, “There are old climbers and there are bold climbers, but there are no old, bold climbers”—one of the most recognizable catch-phrases the climbing world has ever produced. However, the comment inadvertently points to the simple truth that most climbers don’t last—well, their bodies don’t last—longer than a decade or, if they’re lucky, two. Fred Beckey, who was one of the boldest when he was young, and who remained active over an eight-decade span to become one of the oldest, was the living paradox of the ago-old and unfulfilled sentiment. Beckey will be buried Saturday, Nov. 4 at 1 pm, at Mountain View Cemetery, 12874 Cemetery Road, Leavenworth. A public memorial service is being planned for a later date in Seattle.